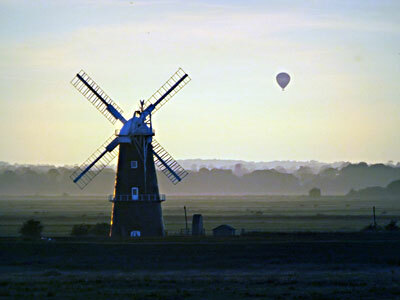 Reedham Berney Arms High Mill in the parish of Reedham on Halvergate Marsh, when built, became Norfolk's highest drainage mill. The seven storey red brick mill was over 70ft high and was built in 1865 by millwrights Stolworthy of Gt Yarmouth to replace an earlier_towermill on the same site and was named after the Berney family. The mill was powered by 2 pairs of double shuttered sails with pitch pine stocks, set on an iron windshaft, struck by rack & pinion. One pair of sails were built for the mill and the other pair were brought in from elsewhere. One pair had 7 bays of 3 shutters with an additional 2 bays of 3 shutters on the inner side and the other pair had 9 bays of 3 shutters with an additional bay of 2 shutters on the inner side.The Norfolk boat shaped cap with its petticoat had a gallery, 8 bladed fan and a tail pole with a chain, turned on a shot curb (ring of rollers). The oak brake wheel had a clasp arm and wooden cogs. A cast iron wallower was set on a six sectioned cast iron upright shaft. The great spur wheel was also made of cast iron with wooden cogs that in turn drove iron stone nuts. The grinding stones were run from the second floor and were still standing on the ground floor in 1972. An iron stage was set around the third floor. 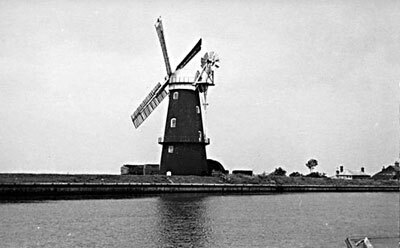 The mill was designed to grind cement clinker, using clay dredged from Oulton Broad and brought to the mill by wherry. 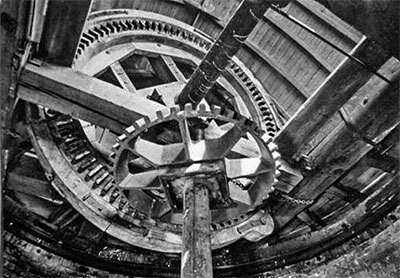 Grinding ceased in 1886 and the mill was then converted to a drainage mill with a 24ft diameter scoop wheel. Two of the clinker edge runner grinding stones were still standing on their edges on the ground floor in the 1970s having been brought down from the second floor where their position could still be made out. 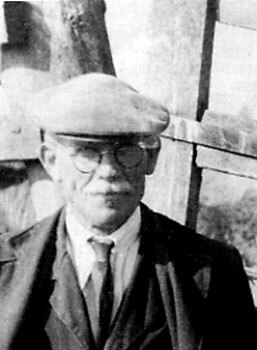 Rex Wailes suggested it was possible that additional stones were used although no traces could be found. The earliest date pencilled in the cap was 1870. On conversion to drainage mill only. 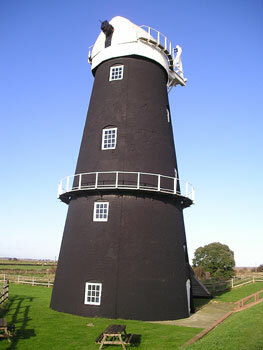 Berney Arms Mill was kept in good repair until last March, when fractures at the top of the tower prevented its head from turning. It was essential at once to ease the pressure by removing the vanes or a strong wind might have wrecked it. The Ownership of the Mill is now being transferred to the Ministry of Works as an Ancient Monument. Information as to its history would be welcome. Mr. Rex Wailes estimated that it was built about 1800, but I cannot discover by whom or whether it replaced an earlier windmill. For many years it not only acted as a drainage mill, but also supplied the power for a cement works, the remains of which can still be seen alongside it. 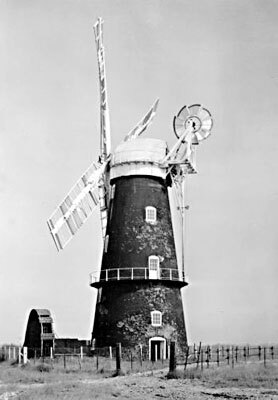 Smithdales of Acle restored the mill in 1951, when the cap, windshaft and sails were jacked up as the curb had split. 5 of the 8 curb sections were renewed. 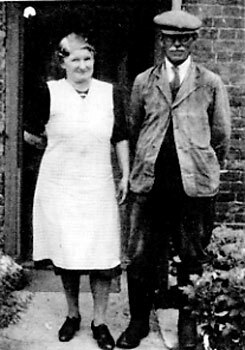 On 3rd August 1954, while on a sailing course at the mill run by The Central Council for Physical Recreation, Miss Lily Read was killed when her 16ft sailing craft was struck and run over by the Resolute pleasure steamer from Yarmouth. The Coroner, Mr. G. L. Talbot, commented that if courses continued to be run from Breydon Water, he would not be surprised if another fatality occurred. 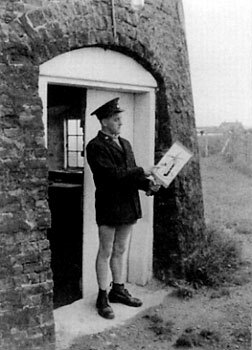 The centre ceased to operate in 1955. In 1967 the mill was restored as a National Monument by the Ministry of Public Works & Buildings. 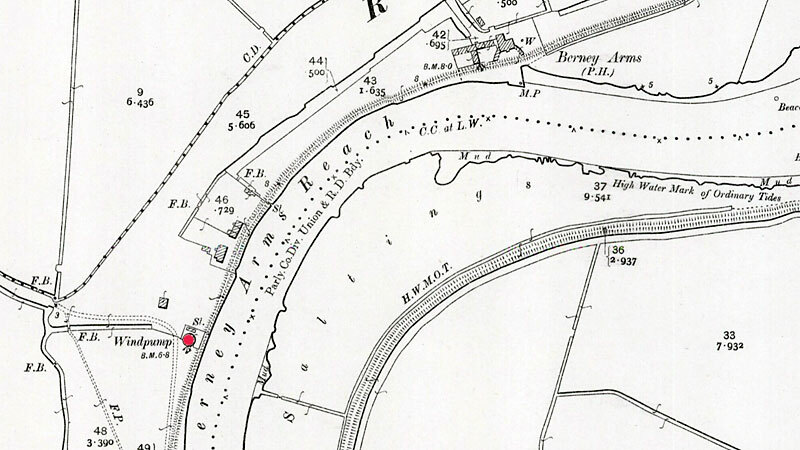 There was another cement factory at Berney Arms on the north bank of the Yare within sight of Burgh Castle. 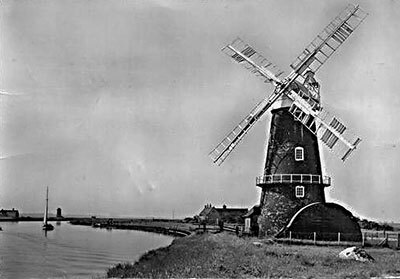 The lofty windmill which still stands like a sentinel in that lonely spot did more than pump water off the marshes in those days; it ground cement clinker for the Reedham Cement Works, as the factory was known, the vertical stones being situated on the second floor of the 70 foot tower. 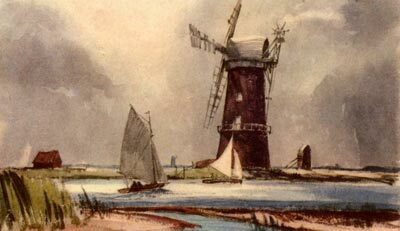 Just when that mill was built, by Stolworthy, the Yarmouth millwright, nobody seems able to say, but it was there in 1860 when the Reedham Cement Works was to let; it was said in the advertisement(Norfolk Chronicle - 3rd, 10th & 31st March & 7th April 1860 that actually referred to the earlier mill the dated back to at least 1821) that the mill, with its patent sails, was twice as powerful as the 12hp steam engine which powered another part of the factory and it stood for many a year after the works closed in 1880. It did a useful job of clearing water from the marshland dykes until after the second world war, when electric pumps took over as most of the marsh mills followed the wherries into oblivion. 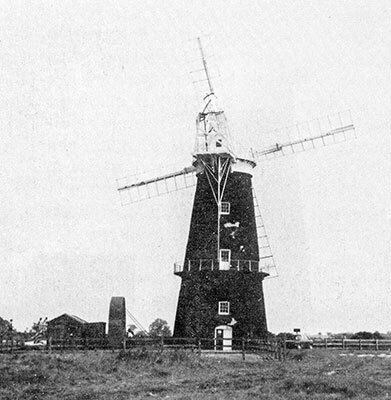 Berney Arms Mill was transferred by the Lower Bure, Halvergate Fleet and Acle Marshes Internal Drainage Board to the Ministry of Works in 1951 for preservation as an historic Monument. But at one time she ground cement clinker and was probably built for that purpose. Two of the stones used for grinding can still be seen standing on their edges on the ground floor. When in use they were situated on the second floor and their position can still be made out. It was possible, although not certain, that additional pairs of stones were used, but not a trace of their driving gear is left today. This superb tower mill stands 70 feet 6 inches tall over the cap with a tarred tower of seven storeys. 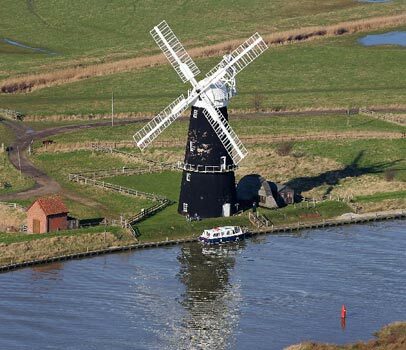 It is thought to have been built solely for cement grinding by Stolworthy of Great Yarmouth in 1865 for the Berney Family, and later converted to a windpump. As Rex Wailes explained, "The chalky mud dredged from the river was burned to produce cement clinker; this was ground in the mill by three pairs of 4' 6" diameter peak stones situated on the second floor. At the same time the steam cement works at Burgh Castle used to send clinker by wherry to be ground at the mill." The works closed in 1886 and the mill was then converted for drainage use. After ceasing work in 1948 it was taken into the care of the Ministry of Works who carried out a thorough restoration between 1962 and 1965. The tower has an iron reefing stage at 3rd floor level. The elegant boat-shaped cap with its iron-railed gallery runs on a shot curb and is turned into wind by an 8-bladed fantail. Power is provided by large 10-bay patent sails which span 82 feet; they have recently been removed for repair. 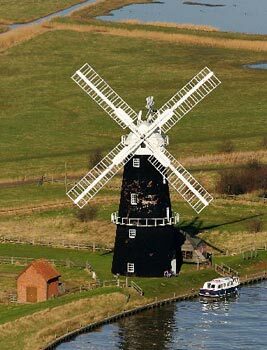 A notable feature, as seen on many Broadland mills, is the striking chain guide pole which extends down from the rear of the cap. This prevents the chain from swinging about in gusty weather when the striking weights can foul the mill tower. The iron upright shaft and wallower are driven by an all-wood clasp-arm oak brake wheel 8 feet in diameter, surrounded by a brake of poplar. 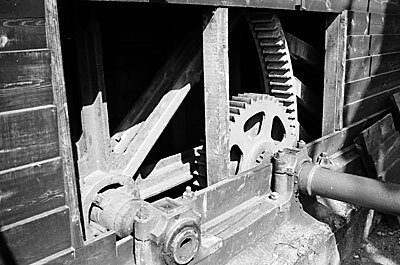 On the ground floor two mitre gears (equal size bevels) transmit power to a scoop wheel located some distance from the mill. The wheel is 24 feet in diameter by 11 inches wide and turns 7 times for every 20 revolutions of the sails. 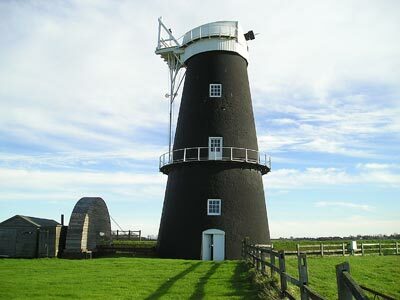 The seven storey 70' mill was later converted to a drainage mill and carried on working until 1948. 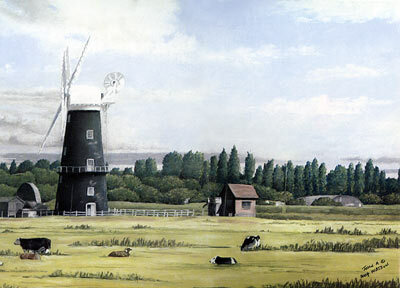 The mill was eventually taken over by English Heritage and was then preserved. All four sails were intended to be replaced in the summer of 2000 but it appears this did not happen. However, the cap was replaced in 2003. 2008: Mill open to the public 1st May to 31st August for pre-booked groups only.